The Brief: Could Perry Soon be Dancing With the Stars? Former Gov. Rick Perry may be taking a break from campaigning to bust a move on the dance floor, following reports that he may be joining the next season of "Dancing With the Stars." Former Gov. Rick Perry may be taking a break from campaigning to bust a move on the dance floor, following reports from an entertainment website that the politician may be joining the next season of "Dancing With the Stars." As The Dallas Morning News’ Hannah Wise put it, “Perry's is taking the Texas two-step to 'Dancing with the Stars. '” Reports indicate he will be a contestant in the show's 23rd season, slated to premiere on Sept. 12 on ABC. Despite speculation on his involvement with the show's next season, however, Perry has declined to comment. Although the news will not be officially confirmed until Tuesday morning on ABC's "Good Morning America," Entertainment Tonight reported Monday night that the longest-serving governor in Texas history would be joining the likes of Vanilla Ice, Amber Rose and Olympians Ryan Lochte and Laurie Hernandez. 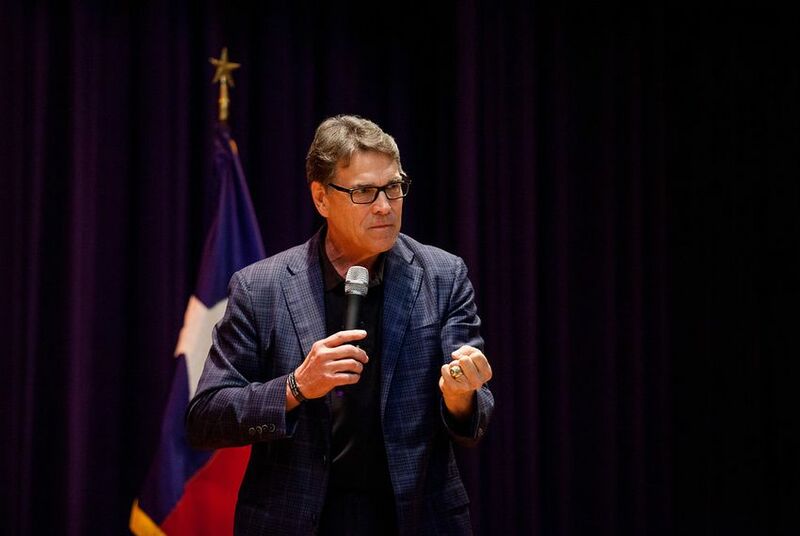 As the Tribune’s Patrick Svitek reports, Perry would not be the first Texas Republican to step on the show's stage. During the show's ninth season, Tom Delay, R-Sugar Land, was set to compete alongside Cheryl Burke. However, the former majority leader of the U.S. House of Representatives suffered foot injuries and left the competition early. Rich Schools Hopeful Houston ISD Could Topple Robin Hood Plan, by Kiah Collier — Texas has deemed an increasing number of schools as property-wealthy, requiring them to give up a share of their local tax dollars to help buoy poorer districts and exacerbating resentment from school officials. Privatized Immigration Detention Centers to Be Focus of Federal Review, by Julián Aguilar — The U.S. Department of Homeland Security on Monday called for a review of its current policy of detaining undocumented immigrants in private, for-profit facilities — several of which are in Texas. The House Transportation Committee will talk about Uber, Lyft and other transportation network companies during a morning hearing in the Capitol complex. In an afternoon hearing, a select House committee focusing on transportation planning is scheduled to receive updates from a TxDOT working group on changes in how the state prioritizes and finances transportation projects. "These religious campuses need to come out and say, 'Yes, we discriminate. We don't want LGBT people to come to our campus.'" Today, The Texas Tribune is launching “Unholstered,” a seven-part, data-driven investigation into police shootings in Texas. Among today’s featured pieces are a look at what the data shows and a story on the lack of reliable, consistent information on police shootings in the state.